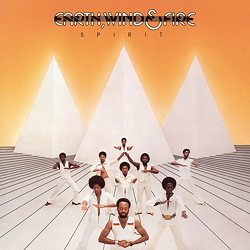 ﻿The wise saying »spiritus ubi vult spirat« (»the spirit blows where it wills«) is interpreted by Earth, Wind & Fire with impressive clarity. Gentle sounds and modest gestures are foreign to the colourful Afro group, who in their live performances welded together ancient Egyptian Pharaonic mysticism with urban street life. That this spirit, which is found in the LP title and blows all the way through it, was guaranteed not only by the exuberant wind section in the group’s early years. With regard to rhythm, too, the band rolls out almost everything to pave the floor with powerful disco patterns, not forgetting the elegant and finely controlled falsetto, which adds further pep. Out of all this came the highly cultivated and expressive vocals as in "Imagine", carefully balanced ballads ("Burnin’ Bush"), as well as a powerful sound that is so good for dancing to, as in the memorable number "Saturday Nite". An extremely wide range of musical genres was brought together by Earth, Wind & Fire in a big-band sound that is »innovative yet popular, precise yet sensual, calculated yet galvanizing« (Rolling Stone Magazine).